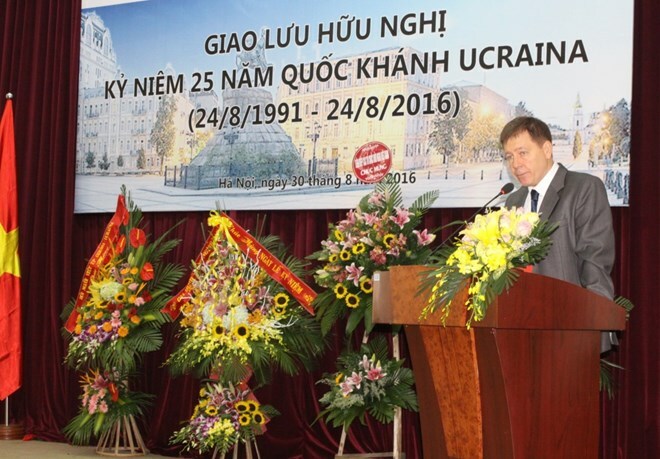 Hanoi (VNA) – The Vietnam – Hungary Friendship Association (VHFA) held a ceremony in Hanoi on August 19 celebrating the 26th anniversary of National Day of Ukraine (August 24) and the 25th anniversary of bilateral diplomatic ties (January 23). Speaking at the event, VHFA President Dang Van Chien hailed prospects of bilateral ties across agro-fisheries, garment, machinery and spare parts, technological transfer and tourism in the future. The VHFA and Vietnamese people in general commit to supporting Ukrainian people, he said, adding that he believes bilateral ties will continue thriving in the coming time. Ukrainian Ambassador to Vietnam Oleksiy Shovkoplias said his government always strives to provide support for its people, including Vietnamese nationals living and working in the country.